Personal finance site GoBankingRates.com helps Americans celebrate Independence Day 2013 without going over budget by releasing their new guide to the best July 4th discounts, deals and freebies. While most people are accustomed to looking for sales when preparing to cook for their gatherings, many don’t consider the other July 4th deals. Two out of three Americans recognize the nation’s birthday with a cookout, barbeque or picnic, according to a survey from the National Retail Federation; and according to a recent estimate from Huffington Post, a July 4th BBQ could cost upwards of $300 for first time grillers. When factoring in the cost of fireworks and transportation, GoBankingRates.com finds Independence Day expenses quickly add up. To help consumers curb their costs and find top bargains, GoBankingRates.com surveyed banks, retailers, and restaurants to locate the best July 4th deals, discounts, and promotions available. “While most people are accustomed to looking for sales when preparing to cook for their gatherings, many don’t consider the other July 4th deals,” says Stacey Bumpus, expert contributor to GoBankingRates. The savings guide also includes a list of travel services and destinations offering discounts to help consumers travel for less. 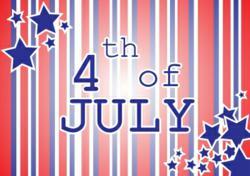 See the full list of July 4th deals and the offer details; please visit GoBankingRates.com at http://www.gobankingrates.com/savings-account/4th-july-2013-freebies-deals-discounts/. For questions about this guide or to speak with a GoBankingRates editor, please use the contact information below. GoBankingRates.com is a national website dedicated to connecting readers with the top interest rates on financial services nationwide through tables for CD rates and savings accounts. The informative personal finance resource collects interest rate information from more than 5,000 U.S. banks and credit unions, making it the only online rates aggregator to provide authentic local interest rate information. Additionally, GoBankingRates partners with a number of major media outlets such as Business Insider and US News & World Report to provide compelling personal finance content. Its expert editors have been featured and quoted on several premier finance websites like Yahoo! Finance, Forbes, The Street, Huffington Post and more. National Retail Federation, “Millions of Americans Planning 4th of July Festivities, According to NRF,” 23 June 2010. Huffington Post, July 4th BBQ: How Much It Will Cost You, 03 June 2012.